It’s a mark of a good story, in my mind, if I’m one to like it when everyone else hates it. Well, maybe good is too strong a word – look at something like Alien vs. Predator. Schlocky, brainless action-fun with the only decent acting coming from that guy from Millennium. I love it (mostly for the Predator bits) while almost every other human being I know over the age of 18 thinks it’s crap. 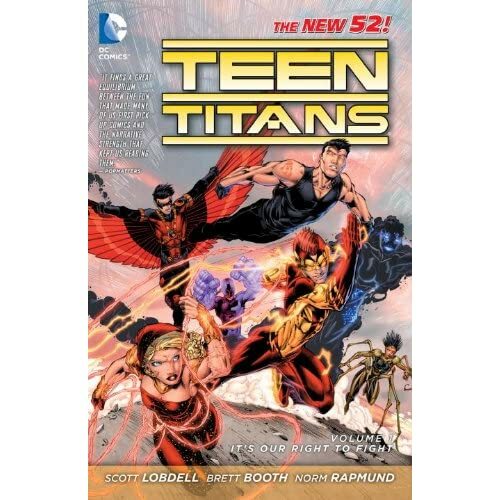 I tend to be a bit of a magnet for storylines and people that most of my companions would rather live without, which has now tended to be the case with the works of Scott Lobdell. As I’ve previously covered I was quite surprised by how much I loved Superboy but was surprised to find most people online hated the pants off it. Apparently the reinterpretation of a goody-two-shoes Superman ripoff into a cynical, jaded youth (with minimum angst) who can blow up trains with a flick of his finger is something to be feared and ridiculed. From what I understand Lobdell’s taken many, many hits about Red Hood and the Outlaws‘s overt sexism and female proportions on par with a six-foot hourglass with basketballs mounted on the top, and the vitriol seems to be flowing thick and fast for his current Teen Titans run. Now, if you cast your mind way, way back into the mists of Sunday Dash prehistory, back when I was still a penniless Facebook reviewer with a penchant for annoyingly tagging people in posts they didn’t want to read, you’ll see I checked out a Blackest Night tie-in involving the Titans; I’m guessing they dropped the Teen from the title so as not to provide fuel for pedophiles. I did enjoy the experience, and found the miniseries to be one of the better of the crossover event over others like Superman (no surprise) and Batman (lots of surprise). This iteration is so far away from the original formula it’s evolved almost into its own lifeform, as far as I can understand it with limited knowledge of the Titans beforehand. It kind of evokes Season 9 of Stargate SG-1 with a dude (in this case, former Batman protege Tim Drake) assembling a team of like-minded individuals to take on baddies who are coming after emerging metahuman teens. On the roster for this gathering is Cassie Sandsmark (don’t call her Wonder Girl), a dude named Bunker (who takes the prize for most awkward dialogue), an out-of-time Kid Flash (who may or may not be a murderer/thief/political activist/botany enthusiast) and two other randoms named Solstice and Skitter. The plot also crosses over with Superboy a lot, and it really casts the former Boy of Steel in a rather antagonistic light. Obviously we all know he’ll turn good and join the team at some point, but for now if this was a high school drama then Superboy would be the hot senior who beats up nerds and cheats on Emma Stone’s character with a blow-up doll. I really cannot understand why so many fans are outspokenly against this title. It’s not the greatest piece of graphic literature ever devised, but it’s fun! Seriously, who can’t see the appeal in a bunch of superhuman teens (and Red Robin) wrecking up an aircraft carrier or messing with Time Square during New Year’s? And why can’t people see the enjoyment in a teen book that doesn’t have Chernobyl-level angst radiation going on? You’d think being as depressing and whiney as a malfunctioning jackhammer was something of a prerequisite whenever teenagers are involved in a story. The artwork by Brett Booth is pretty good, even though the faces get a little weird every now and then and make them all look like they’ve had botox recently. Shading can get a little excessive, but on the whole it’s fleshed-out and visually appealing. Dialogue is a bit clunky here and there (including an absolutely awful admission of homosexuality by the aforementioned Bunker that I believe was meant to come off as casual but ending up sounding shoe-horned in) but overall is fairly good. As I said there’s very little angst (apart from a bit of Superboy-introspection that comes and goes quicker than a lit match in a snowstorm) and it makes for a refreshing change to the regular teen-story affair. Of particular note is Kid Flash, whose every line of dialogue made me giggle. I really should find a more masculine version of “giggle” to use in these reviews. Something my father taught me is that you can’t fully condemn something unless you know the thing. You can’t knock Fifty Shades of Grey until you read it, and you can’t say a political party’s bad news unless you’ve really looked at their policies, people and the number of times their leader has stood out in public wearing Speedos. Having now experienced Teen Titans: It’s Our Right to Fight, I can safely say that it really is good. It’s not William Shakespeare, but it’s not Stephenie Meyer. It’s got charm, wit, an appealing story and some great artwork. And at the end of the day, what more can you ask for?